We were five little girls. One day, Atty Chadinoff took us to Madame Preobrajenskaya’s class. Twelve or thirteen years old we must have been, and a very emotional visit it was, even though we could not have realised that the tiny old lady, whose every gesture spoke Dance, had long been part of the history of art. In her studio on the next-to-highest floor of the Studio Wacker, the atmosphere that seemed exceptionally light and stimulating. Madame Preobrajenskaya had a naughty sense of humour, and would chase us from our place with her watering can, sprinkling droplets on the floor to prevent us slipping. After a first few lessons, I began to study with her regularly. Although her instructions were always very precise, one had to be alert to catch on the wing the treasures she would let fly. Some things seeped into my pores, and have led me to strive to teach a dance as pure as possible, a dance passed on by Masters amongst whom, she was the most illustrious. Despite her age and my lack of experience, her light touch - subtle but full of authority – has left a deep mark. She knew exactly what she wanted from her students and would not rest until she got it. Our mother was born in Russia. A singer, she made sure that we were in contact with music and song from our earliest years, and she combed Paris to find a suitable dancing teacher. Until she found Atty (Ekaterina) Chadinoff. Born in 1908, in Russia, Atty had left Russia during the Revolution. Her father had been a petrol magnate at Baku. They lost everything. On reaching Paris, Atty began to study with Olga Preobrajenskaya. Atty was an extremely gifted and creative individual. Attracted by what was then « modern dance », her feeling for space and expression was quite wonderful. Atty had a sister who became my first teacher. Her stage name was Lutys de Luz, a truly marvellous Spanish dancer – she must have known all and I do mean all, the dances of Spain. Lutys was such a master of the castanets, she could interpret a piece of music by playing the castanets alone – no dancing - and hold an audience rapt through the evening! 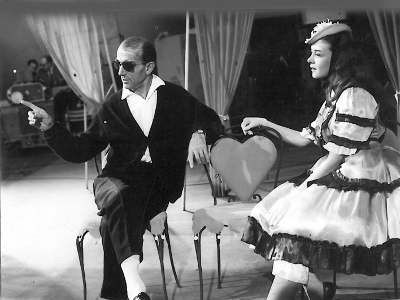 Lutys, who was my first teacher, eventually joined the Ballets du Marquis de Cuevas as a Spanish dancer. Although Atty Chadinoff taught in a direct line from Madame Preobrajenskaya, the latter paid rather less attention to placement. And so her own studies were to give a scientific foundation to Madame Preobrajenskaya’s teaching. Two particularly innovative physiotherapists, the Boudines (a married couple) came to work alongside Atty. Robert Boudine too was a Russian émigré (BUDIN), who used to visit Atty’s studio to watch. In consultation with the Boudines, Atty made up special floor-exercises to do before the barre. How does one strengthen the back? How does one become aware of and control, movement in the hip-joint? How does one use the turnout? Atty rejected work that relied on lax articulations: all movement had to be under conscious control. One could in fact say that she was the first movement-analyst. Like Madame Preobrajenskaya, Atty had us dance throughout the class, from the moment one placed one’s hand on the barre. But in terms of placement, she took no prisoners! To that end, her barre was short, simple and certainly never « choreographed ». By the way, Atty had no boys in her studio in the 16th arrondissement, but she did teach boys in Volinin’s studio. In my own work, I have attempted to retain the purity of what Madame Preobrajenskaya and Atty taught; my contribution has perhaps been a somewhat more exact science of appuis. The foot must be properly placed on the ground, so that one feel how the head of the femur turns; this serves to protect the elasticity of the knee-joint, a most vulnerable joint. Which is why I never say « tighten the knee », but rather ask the student to lengthen from inside the leg. What « pulls up » the knee right, is how the foot is placed and the hip-joint aligned. Madame Preobrajenskaya made much use of the third position, one that definitely has a raison d’être: it promotes proper body-placement. With one foot « cupped » as it were, in the other’s arch, turning out is easier, the hip-joint will be aligned and accordingly, the back and arms well-placed. There is no point in insisting upon a tight fifth with someone who is unprepared and unaware, as he will only misalign the hip-joint and imperil the knee and ankle. The spinal column acts like a spring, transmitting the body’s weight down through to the ground via the feet, which are ears listening keenly to the ground. If the foot is lively, aware and strong, the dancer will respond easily and readily to any technical demands. Reacting to each movement of the body, the foot lends an elasticity, that will activate all the muscular chains from the bottom up. Gradually the dancer will learn to use a great range of appuis – fanning out the toes, propulsion through the under-arch, pushing-off with the toes that gives great speed …Atty paid great attention to the foot on landing, to a proper brush-through when opening and closing a position, so essential for glissade, assemblé … and to activating both feet at once. When a dancer is truly on his line of aplomb over both feet in fifth position, it is impossible to say which leg will open first. If a dance is to be three-dimensional, rather than flat as a pancake, all movement must flow from the centre of the body. That is why I will not have people working in front of the glass. Young people are not to work with their image, but with their body as a volume. And the glass distorts how one casts the eye, whereas for Madame Preobrajenskaya, the eye-light must both precede a gesture, and prolong it. Atty insisted we be a presence vis-à-vis others, and very conscious of the other dancers. This is a fundamental aspect of training. In the middle, Atty would have us perform enchaînements in twos or threes, to make us aware of with whom and where we were. Working thus consciously, awake and aware, the facial expression lights up, and the artist suddenly has something to say. That is how, early on, we children learnt to engage the oppositions. At Madame Preobrajenskaya’s class, the barre lasted 20 to 25 minutes. 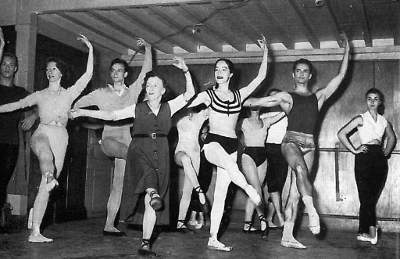 Although at the time, it was common for teachers to give the barre all over again in the middle, she would simply start the middle with a few battements dégagés, temps lié, adage. Her enchaînements were rather short, and simple. I can recall their purpose now, and how she would clearly delineate the dancer’s head, and the eye-light. There were certain very particular aspects. For example, in pirouettes, so as to finish with the arms open to the public, we would open arms with the back to the public on the final pirouette. Madame Preobrajenskaya and Atty taught from the human being as a whole, heart, mind and body. Their ideal of the dance precluded any twisting and forcing. Indeed, were I asked to state, in a nutshell, what has changed over the past three decades, it is that the violence inflicted upon the body has sucked all meaning out of the dance. We were expected to be 100% present from the first to the last instant of an exercise: once on stage, that is what defines one’s relation to a partner, and to an audience. It was out of the question to end a diagonal any which way, or to drop half-way through an exercise. And there was a proper way of leading into, and finishing off, every step. We’d go back upstage in a pas courru or a pas de bourrée or whatever, but the exercise had to be neatly finished. Again, for port de bras, one was to pass through first, and in general, pay the greatest care to the passage of the arms, notably in arabesque. No « poses » either, but rather a « hover » (temps de suspension) as I later saw with Massine too. And no such thing as « pretty » arms or « pretty » hands, unrelated to a proper functional reason. In everything required of us, there was a good reason, and neither Madame Preobrajenskaya nor Atty would waste time with clichés. Madame Preobrajenskaya and Atty expected us to be intensely alive and present in the music: from the very first chords, the dance exists in an apparent stillness, until the very last note have sounded.